Worried that too many students will want to use your chalkboard easel at the same time? With a four-sided unit, everyone can get a turn to color, draw or paint. If you are looking for an easel that can work with many mediums, a blackboard easel is a great option. Papers can be clipped on for painting or coloring with crayons, or children can simply enjoy drawing with chalk. Unlike a lot of other materials, chalk easily wipes off of hands and washes out of clothing, and it won’t make a mess on the classroom floor. These chalkboard easels by Wood Designs are perfect for Picassos-in-Training! They build creativity and important pre-writing skills in a fun and inviting way. 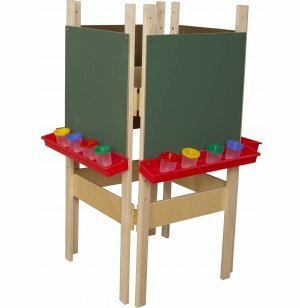 Birch plywood construction and a Tuff-Gloss finish provide many years of enjoyment in the classroom. 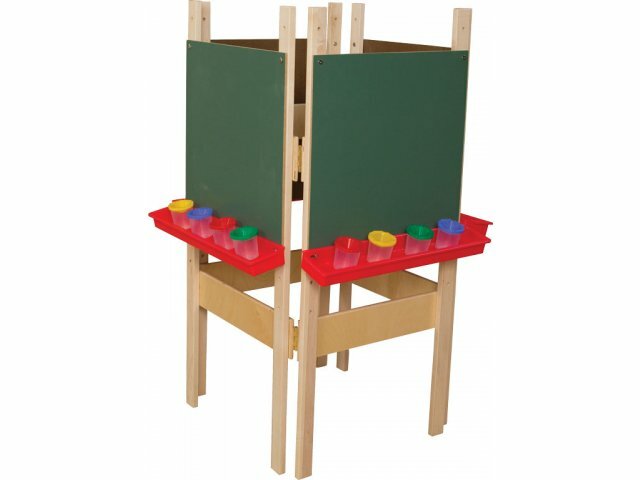 With safety features such as fully-rounded corners and edges, these kids easels are the perfect choice for your classroom. Friendly Design: Smart design allows junior artists to work next to each other without interfering with their classmate's artistic vision. Durable Construction: Built by experienced craftsmen to the highest standards of detail and workmanship. Tough Materials: Built from 100% birch plywood (including backs and shelves) for an attractive natural strength. Beautiful Finish: Greenguard Tuff–Gloss™ water–based paint finish provides lasting beauty. Safe Materials: No formaldehyde, lead, phthalates or VOCs. CARB II and CHPS compliant. CPSIA conformity. Worry Free: With fully–rounded corners and edges, you don't have to worry about scratches and bumps.